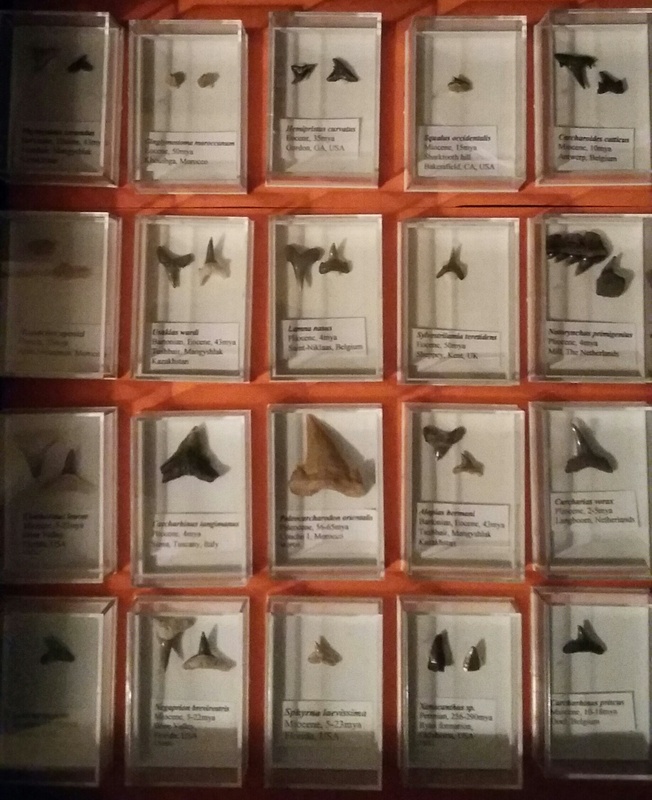 I’ve been collecting fossil shark teeth now for about seven years and I wanted to tell you about what is a rewarding, educational and fun hobby. 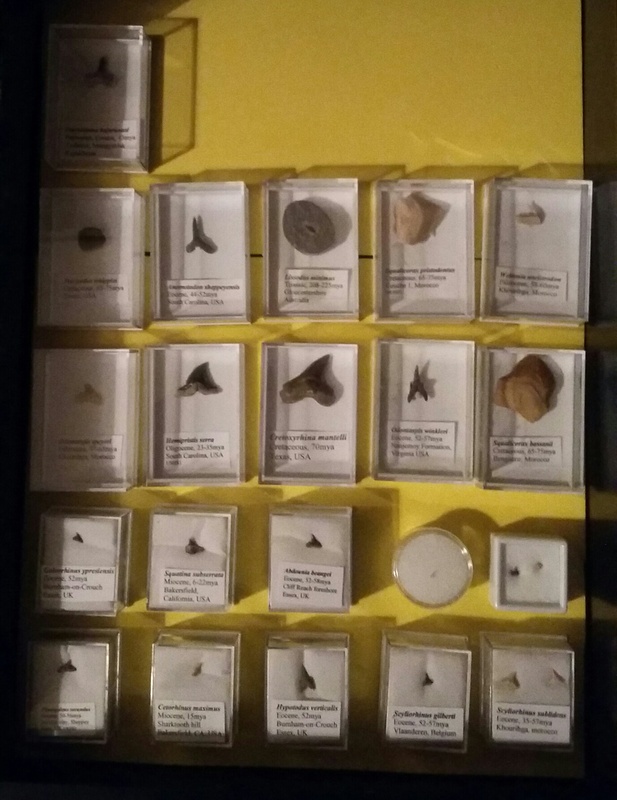 What started as just a couple of teeth bought from a fossil shop has now reached over one hundred ‘display’ specimens, representing over ninety species including some pretty rare ones, and hundreds more in my ‘swap or sell’ collection. 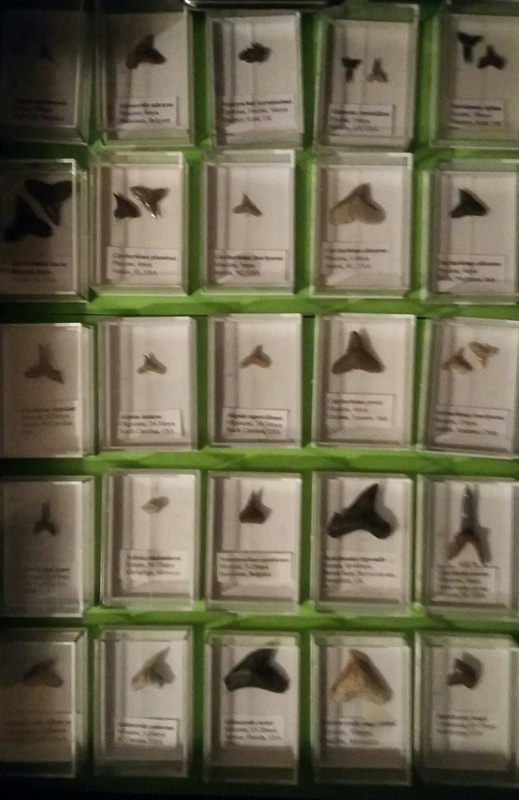 My interests and preferences in shark tooth collecting have grown and changed as my collection (and experience!) has expanded over the years. I’ve also learnt some good lessons over the years and wanted to share these with you in the hope that I might tempt more people into this fascinating hobby. Ethics. Firstly I don’t collect jaws or modern teeth. EVER. I refuse to contribute to market pressure that increases the threats that sharks face. They have enough. Even if I knew one hundred percent that a modern tooth hadn’t caused the death of a shark, such as being collected from the bottom of an aquarium, I still think it has no place in my collection. Having one is a slippery slope and there are some internet dealers who will advertise ‘sustainably sourced’ teeth that have in fact come from fisheries bycatch. By buying one you are saying that there is a use for the bycatch when actually it would be better if we looked to address the issue and reduce bycatch of sharks. It has been estimated that one hundred million sharks are killed by humans every year; there is no sense in collectors adding to this tragedy. The reality is that nearly all modern shark lineages are at least a few million years old and fossil examples can be found for extant species if you know where to look or who to ask. You can collect teeth both ethically and without compromising your collections potential. Information. The most important thing in any collection and especially a biological one is to keep records and label your specimens. Luckily I decided very early on that this was important to me and now add labels to teeth as soon as they come into my collection. Each tooth has a label with at least the Genus, Species, Age and Locality. Furthermore I also keep an Access database with many additional items of information about each specimen contained such as Source, Cost, and particular Stratigraphy etc. Whilst this may seem excessive it is important that any specimens you collect yourself have at least basic information accompanying them or they are scientifically worthless. Display. 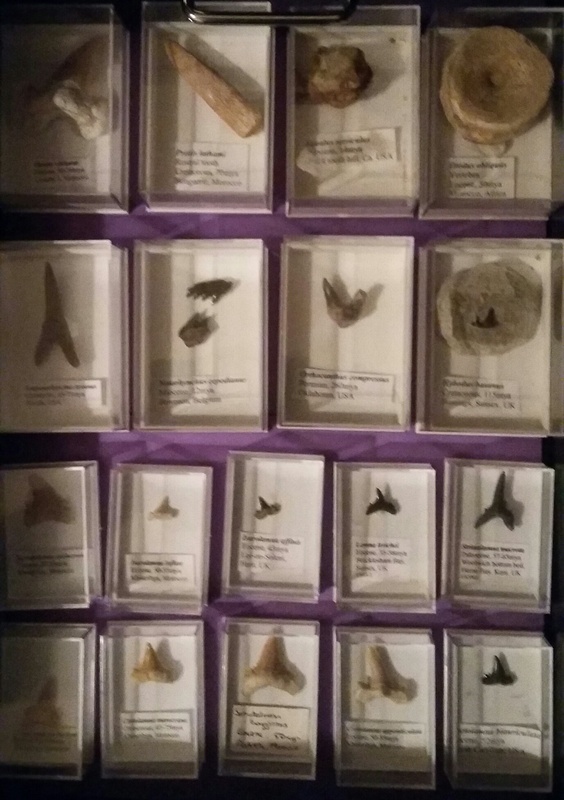 There are many ways to display fossil shark teeth and my own collection has changed over the years. One of the most basic and common ways to display teeth is in a Riker Mount; essentially a black box with a see through lid and soft mounting fabric inside. 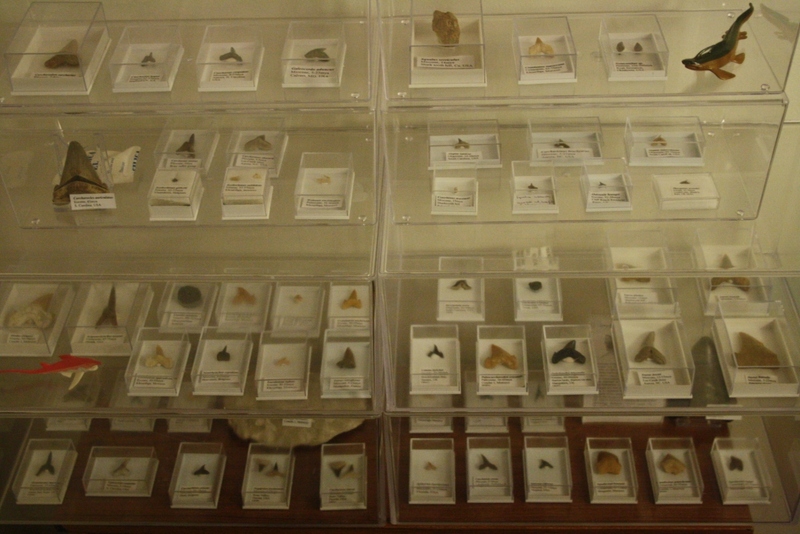 Many collectors use these but often forget to add information labels, essentially reducing their teeth to nothing more than decorative stones. I keep mine in individual plastic display boxes which not only protects the specimen well but keeps the information label with it. At first I had my teeth simply arranged on a shelf in their little boxes but after I had about forty specimens I purchased some larger acrylic display boxes that stacked together. These worked well initially but they do get scratched and look old fairly quickly. As my collection grew I purchased lighted glass display cabinet as well as some acrylic stands and steps to better display the specimens. These looked great and were a fantastic talking point for guests! 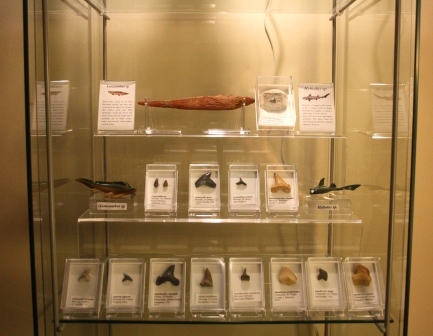 I even added some plastic prehistoric shark models to allow visualisation of the living animals. My latest incarnation of collection display is a little less aesthetically pleasing but far more practical. I now have a metal Bisley drawer set. This allows me to keep all my collection, plus swaps, spare boxes and mounting materials together and in a compact storage option. This has been especially useful for moving and taking my collection to display for special events. Ultimately display is personal preference and there are many more options than the ones I have highlighted – just don’t forget the information labels! Specialisation. When you first start collecting a fossil shark tooth is a fossil shark tooth and you simply collect whatever you can. As your collection grows however you can find that your collection may become unwieldy and you may need to specialise. What you specialise in is entirely personal preference and what you find most interesting. It could be a particular family, a particular locality or a particular geological age or something else entirely. Your interest may even change over time. I have found myself being drawn to the smaller sharks and especially the catsharks or Scyliorhinidae so for the foreseeable future this is where my collection will begin to focus. Source. Where do you acquire specimens from? Like I said I started with just a few specimens from a local fossil shop but most fossil shops will stock only two or three species and often with poor locality information. If you are lucky enough you may live near a local fossil hunting site. In the UK there are many good hunting grounds including Bracklesham Bay, Burnham-on-Crouch, the Isle of Sheppey and others. It is wise to do a little research online to find if you can collect fossils close to your location and www.ukfossils.co.uk is a great place to start. Just remember to collect safely, check tides if appropriate and always ask the landowners permission before collecting. If like me you live far from good collecting areas then purchasing over the internet is the best option. I’ve listed a few great internet resources at the end of this blog. A word to the un-initiated. 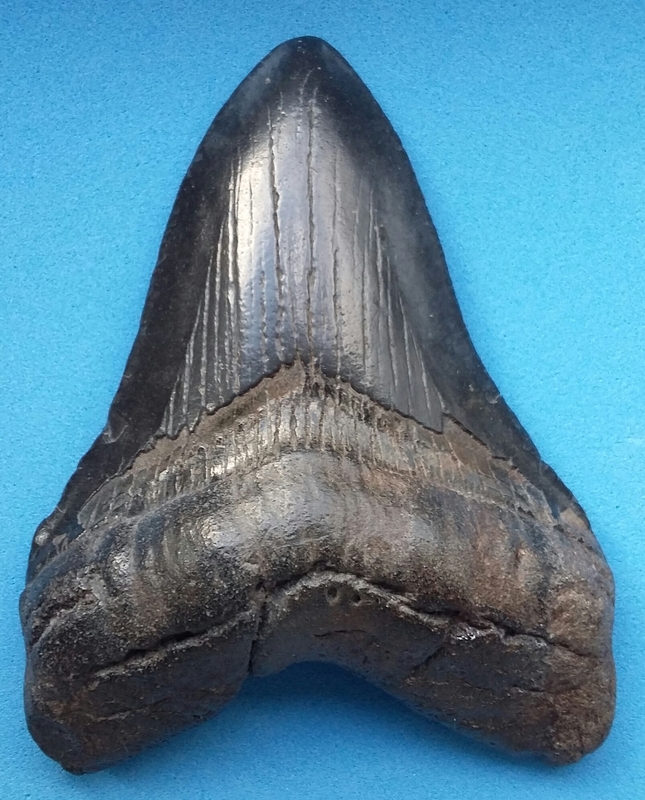 Be cautious if you are purchasing shark teeth through online auction sites. There are some good dealers that sell this way but specimens often come poorly labelled or with little information. That said some items are often mislabelled and if you are prepared to do some research you can often pick up a bargain, purchasing a rare specimen labelled as a more common one. You have to know what to look for though. Alternatively there are many excellent established dealers with their own websites (see the foot of this blog post). 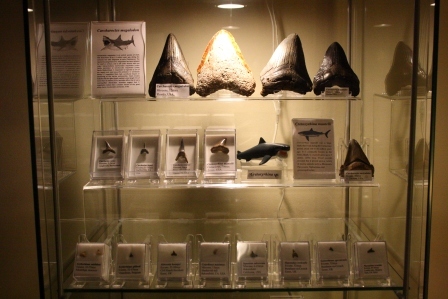 Fossil shark teeth vary in price depending on species, quality, locality and rarity. You can pick up some specimens for just a few pounds each or you could buy a seven inch pristine Carcharocles megalodon tooth for upwards of ten thousand pounds so there is something for every budget. Joining forums is another great way to acquire material too. Often other collectors will offer to swap specimens and it’s also a great way to learn new things and meet new people. There are some very knowledgeable and generous people to be found on online fossil forums. Just remember they are a community however and you have to give something back. 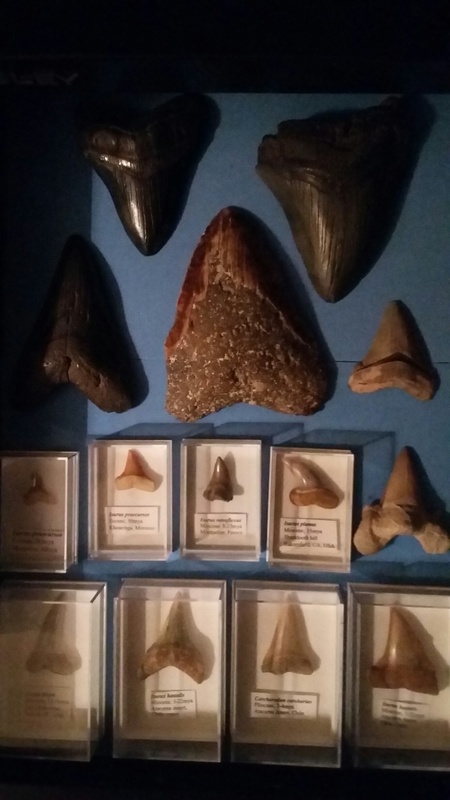 Collecting shark teeth is a great way to learn about the evolution of these fascinating animals as well as venture into scientific disciplines such as palaeontology, marine biology and even museum curation! I would encourage anyone with an interest in sharks to give it a go. Don’t forget to follow my Twitter feed as each day throughout June I’ll be highlighting a specimen from my collection. www.buriedtreasurefossils.com – One of the most comprehensive dealer websites stocking many top quality and rare species. www.megalodonteeth.com – A great, easy to navigate site run by a very friendly dealer. A good place for beginners and experienced collectors. www.lowcountrygeologic.com – A well-presented site with a good selection of species. www.fossiliferous.co.uk – A fantastic UK based site run by a very friendly dealer. He collects all material himself so every specimen comes with excellent information. www.heskensfossils.nl – Some unique and rare specimens. www.ukge.com – Excellent source of collecting equipment and display material.